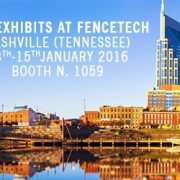 Between 13-15th January, the Fencetech fair is held in Nashville, Tennessee (USA). This is the annual convention of the American Fence Association which brings us up to date with the news and developments from the industry sector. This is an appointment that JCM could not miss. Feel free to visit us at our booth number 1059!